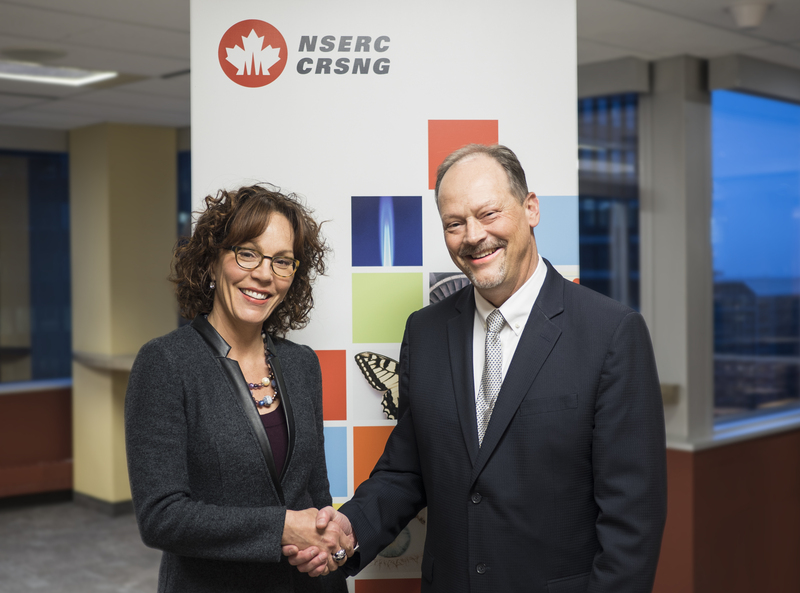 Bettina Hamelin, Vice-President of Research Partnerships, NSERC; and Steve Armstrong, President and CEO of Genome Atlantic, shake hands on a newly-signed MOU to increase collaboration between the two organizations. Genome Atlantic and the Natural Sciences and Engineering Research Council of Canada (NSERC) have entered into a memorandum of understanding (MOU) to increase collaboration and streamline the process by which researchers and industry clients access programs and services. Joint initiatives could include Research and Development opportunities, talent support, training and student employment programs, as well as other related activities that encourage partnership between academic institutions and industry provided there is an economic benefit to the Atlantic region. The MOU will be in effect until March 3, 2020. Genome Atlantic is a not-for-profit corporation with a mission to help Atlantic Canada reap the economic and social benefits of genomics and other ‘omics technologies. Working with a broad range of partners, Genome Atlantic helps companies, genomics researchers and others collaborate around strategic R&D initiatives that create sustainable improvements in agriculture, aquaculture and fisheries, energy, the environment, forestry, human health and mining. Genome Atlantic has helped to enable more than $87 million in genomics R&D since its inception in 2000. NSERC invests over $1 billion each year in natural sciences and engineering research in Canada. Our investments deliver discoveries – valuable world-firsts in knowledge claimed by a brain trust of over 1,000 professors. Our investments enable partnerships and collaborations that connect industry with discoveries and the people behind them. Researcher-industry partnerships established by NSERC help inform R&D, solve scale-up challenges, and reduce the risks of developing high-potential technology. NSERC also provides scholarships and hands-on training experience for more than 30,000 post-secondary students and post-doctoral fellows. These young researchers will be the next generation of science and engineering leaders in Canada.